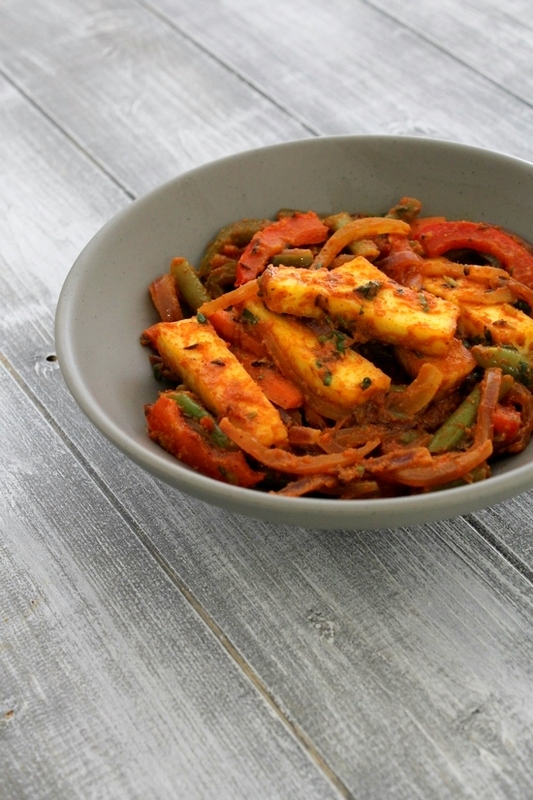 Paneer jalfrezi recipe – Sauted vegetables and paneer pieces are coated with thick, spicy gravy. This is semi-dry curry recipe. Many of you may wonder, what does the jalfrezi means? I am one of those too. I had eaten paneer jalfrezi or vegetable jalfrezi in restaurants many times. But never knew the meaning of it. When I tried this recipe at home, I have done enough research on net about it. Thanks to the food-blogging, I have gained so much knowledge. Jal (jhal) means spicy, hot in Bengali language. As the same says, this is spicy dish made with mix of vegetables and paneer. Addition of vinegar and tomato puree give slight tang to the dish. For making this paneer jalfrezi, I have added few vegetables like onion, green beans, carrot and capsicum along with paneer. Traditionally, blanched vegetables are used and quickly stir-fried in the dish. But to make it in a one pan instead of boiling them in water in separate pan, here I have cooked the veggies in the pan with spices and tomato puree. Hence it is quick and easy to make. 1) Prep all the veggies and rest of the ingredients before you start making the dish. 2) Heat one tablespoon of oil in a pan on medium heat. Once hot place the paneer pieces in it. Lightly fry them. 3) Once you get light golden color on one side, flip them fry other side. Most important, do not over fry them (meaning they get crispy or brown), otherwise paneer will get chewy and dry. Remove the fried paneer in plate and keep it aside. You can dip fried paneer in warm water for some time and squeeze it very gently to remove excess water. This way you will get very soft paneer. 4) Add remaining 1 tablespoon of oil in the same pan and let it heat up. Once hot add cumin seeds and let them sizzle. 5) Then add dried red chili and saute for about 30 seconds. The chili will get darker color. 6) Now add all the prepared vegetables (onion, carrot, beans, ginger, both capsicum). 7) Mix well and saute for 2-3 minutes. 8) Then add salt, turmeric powder, red chili powder, coriander powder and garam masala. 9) Again mix well so all the masala is coated to the vegetables. and cook for a minute. 10) Now add tomato puree. 12) Cover the pan and cook till vegetables are cooked (about 10-12 minutes). 13) Now add sugar and vinegar. Stir well. 14) Add ¼ cup of water, fried paneer and chopped coriander leaves. 15) Gently mix till the thick gravy is coated well to paneer pieces. Make sure that paneer pieces do not break. Cook for 2 minutes and turn off the stove. 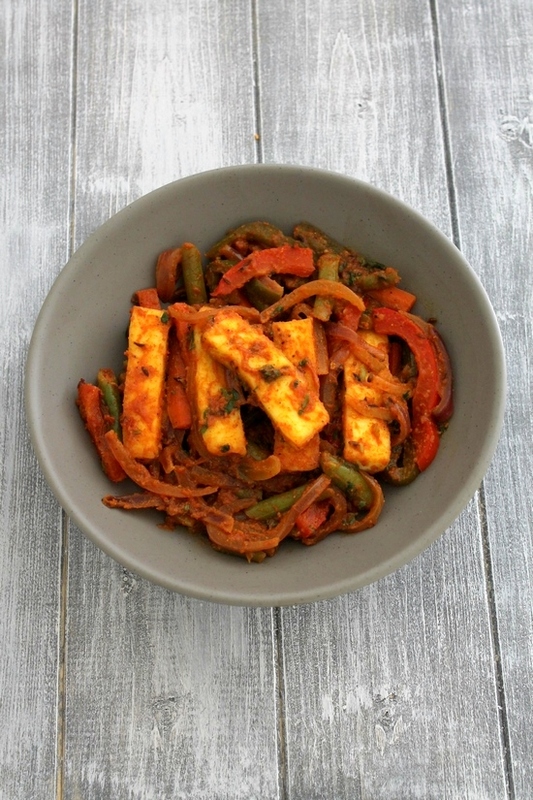 Remove paneer jalfrezi to a serving bowl and enjoy. This is semi-dry curry where thick, spicy gravy is coated to paneer and veggies. Serving suggestion: Serve paneer jalfrezi with roti, paratha, naan or kulcha. Prep all the veggies and rest of the ingredients before you start making the dish. Heat one tablespoon of oil in a pan on medium heat. Once hot place the paneer pieces in it. Lightly fry them. Once you get light golden color on one side, flip them fry other side. Remove the fried paneer in a bowl of warm water and kee in that for 10 minutes. Then lightly squeeze the water and keep the paneer aside. Add remaining 1 tablespoon of oil in the same pan and let it heat up. Then add dried red chili and saute for about 30 seconds. Now add all the prepared vegetables, mix well and saute for 2-3 minutes. Then add salt and all the spice powders. Again mix well so all the masala is coated to the vegetables. and cook for a minute. Now add tomato puree. Stir well. Cover the pan and cook till vegetables are cooked (about 10-12 minutes). Now add sugar and vinegar. Stir well. Add ¼ cup of water, fried paneer and chopped coriander leaves. Gently mix till the thick gravy is coated well to paneer pieces. I JUST LOVED YOUR ALL RECIPES.EASY TO UNDERSTAND,SIMPLE TO MAKE AND DELICIOUS TO TASTE. I always read your recipes. It is very colorful. Today I tried this jalfrezi,but with tofu. It was incredible. One of the best jalfrezi’s I have had (including restaurant ones). My husband also loved it. Thanks for posting this awsome recipe. Thank you Sandhya for positive feedback. Hope you enjoy other recipes too. I’ve just discovered your website and yesterday made this Jalfrezi recipe, the divinely spicy dal and the Gujarati potato dish. As I’m vegan, I use tofu instead of paneer, which seems to work well. Really good recipes, and good for English people like me who haven’t been taught to cook proper Indian food. Thank you Jo for the positive feedback. Very happy to know that recipes are helpful to you.